The guilds of crafts were midway between public and private Institutions, they were founded when the towns expanded and they were mainly involved in controlling their own field. In fact they attended to the class affairs and, at the same time, they warranted the authorities about the quality of the products by carrying out inspections and by repressing abuses. Moreover, the Guilds had the task to guarantee the assistance to poor people or to those who constantly risked to become poor; for these reasons, during the XVI century it was important offering the associates new services such as dowries, sanitary assistance, help in case of indigence or a decorous funeral service. Another typical activity of the Guilds was promoting the veneration of Patron Saint: therefore, in those years, several guilds churches were built, sometimes replacing other ancient ruined churches – in Rome there are several examples such as S. Maria di Loreto for the bakers, S. Maria della Quercia for the butchers or S. Lorenzo in Miranda for the chemists -; these churches were not only the seat for the fraternity affairs but, above all, they represented the reference point, the heart and the identity of the guild. The Goldsmiths Guild was one of the major fraternities in Rome; it was probably established around the second half of the XIII century. According to some papers, it was up and running at the beginning of the XV century, but the real written history of the guild started in 1509 when the Goldsmiths decided to change their old statutes and to build the church in Via Giulia for venerating their Patron Saint, S. Eligio. Year by year, century by century, the papers and the documents issued by the University were stored in this seat and today they make up the precious Collegio archive. 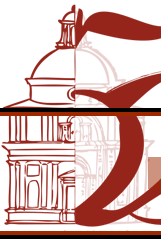 The Historical Archive keeps papers since 1509 and it is one the few guild archive still existing in Italy; it is a complete archive because nearly no documents has been lost and therefore it is very important to know the economical history of Rome. The archive is approximately composed by 200 volumes and one thousand single papers dated from 1509 up today, without interruptions. The Minister of Cultural Estate is now reorganizing the documents dated from 1870 up today. The Statutes that governed the life of the art of goldsmiths are certainly among the most significant items. The first Statutes of 1509 are transcribed on two papers dated 1550 and 1612, handwritten, on parchment, in a very ancient Italian slightly revised in the seventeenth century copy. The statute starts with the most important element, the papal approval, the bull where the Pope Giulio II approves the new Statutes and, above all, gives the area for building the Church “Un loco idoneo per edificare una conveniente ecclesia … . Et in quella adunare et ordinare quelle che risultino ad onore ed utilità degli orefici et construere dicta ecclesia nella via Giulia, sub invocazione de sancto Eligio la quale de mandato nostro se fabbrica apresso al Tevere con opera assai somptuosa …”. The names of the members at the time of the statutes approval let us know where the artisans came from; the largest part were from Rome but they also came from Florence, Milan, Genoa, France and Spain. We mention Caradosio, Bernardino Passeri and G. Pietro Crivelli, among the others personages. This Statute set up the powers of the guild, headed by 5 officials: one Camerlengo and 4 Consoli whose primary task was controlling the goldsmith market; in fact, at that time, it was absolutely forbidden practising the art of a goldsmith or opening up shop without the permission of the University, that issued a license called “Patente” after a scrutiny. The work in the shops was inspected periodically by the Consoli, who had the authority to sequestrate the suspicious objects, to verify their good quality and realization and, in case of fraud, to judge the guilty directly. In fact at that time, and up to the end of the XVIII century when some reforms sanctioned the principle of the assurance of the right, there existed several judging organs because it was still in force the typical Middle Age principle that warranted an individual the right to be judged by a court of his peers. Consequently, the Consoli had the authority to judge the fraud perpetrated in the goldsmith field. The legislative power of the fraternities during those centuries is clearly certified by a document stored in the archive, which is called “Breve” in the papal diplomatics but it is commonly referred to as “Bolla” (bull); in this bull the Pope Paolo V, in 1622, grants the Collegio the privilege, or the authority, of saving the life of a prisoner sentenced to death on the occasion of S. Eligio feast; prisoners convicted of intentional murder, lese majesty, forgers, coiners and heretics were not included. That was quite a common privilege for the guilds; in fact it seems that butchers set free Benvenuto Cellini from prison (at that time the Goldsmiths didn’t have this privilege yet). The statute is particularly important for the documents related to the early laws aimed to control the correct manufacture of gold and silver objects. Since at that time the Papal State had no regulations, the first rules were issued by the Collegio: about this item the percentage of precious metal, the stamping, the kind of weights to be used. The Collegio kept on prescribing rules up to the second half of 1600 and the rules settled by the Statute became gradually part of the official laws of the government. On 1739, the Statute drawn up on 1509 was reformed for the first time. The Console of the Collegio was a prestigious figure; they were often summoned to the Papal Mint to verify and estimate the quality of coins, before putting into circulation. From the beginning of ‘400 up to 1870, the goldsmiths controlled all the coins issued by the Papal Mint. Among the documents stored in the archive, we mention, for their particular characteristics, the Registri where the notary of the Collegio wrote all the deliberations related to the goldsmith filed and the parchment with the authorization given to the goldsmiths by the Cardinal Camerlengo of the Papal State (the title is equivalent to the actual Prime Minister) to clean on one’s own the public ground near the shop, thus giving the goldsmiths the possibility to recollect the metal or stone filings by filtering and selecting the dust. The proceeds from the sale of filings were employed for the church od S. Eligio. Another historically relevant document is the list of the patented professors, where all the names of the goldsmith masters are written together with the number of their Patente, the address of the shop, the date of their death or the one of expiration of business and other specific notes. The present members, with their care and enthusiasm, exploit this historical archive; perhaps it is less evident and known compared to a monument or a church, but it is the real historical memory of the association.